A few years back, a dear friend who has since ceased his war with the flesh commented to me that he did not understand why anyone would call himself a protestant. The Reformation was over – what were we protesting? I implored him to consider the Council of Trent – nothing therein has been retracted. And therein, all who believe in salvation by grace alone through faith alone in Christ alone are considered heretics and beyond “salvation” – according to Rome. In this book, written in the mid-19th century, J.A. 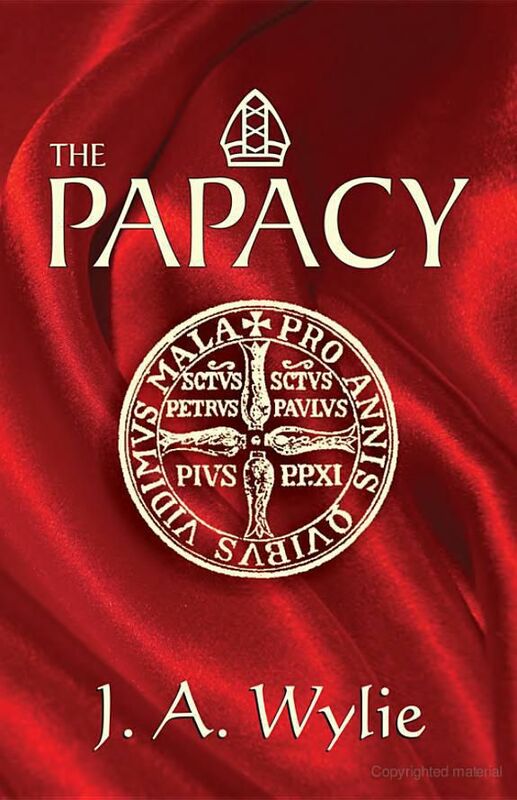 Wylie examines the history of the papacy, the dogma of the papacy, the genius and influence of the papacy, and the policy and present prospects of the papacy – all in little more than 300 pages. As did most reformers, Wylie considered the papacy to be a work of Satan and man. He portrays Satan as the master deceiver and gives us this look at how he worked in the Roman Catholic Church over the years. Here are three short excerpt from this valuable work, which can be read in its entirety here. Let each man who claims Christ stand on the Word of God alone and may God keep us from error. This antagonist Satan could confront with but his old policy. That policy took a new form, to adapt itself to new circumstances: its edge was finer, its complications greatly more intricate, and its scale of operation vastly larger; still it was the old policy, radically, essentially unchanged, beneath its new modifications and altered forms. Satan presented over again to the world the COUNTERFEIT; and he succeeded once more in persuading the world to accept the counterfeit and to banish the real. The great primal truth of God’s unity and supreme and exclusive government was supplanted in the old world by the device of making men adore inferior deities, not as God, but as representatives and vicegerents of God. So in the modern world the leading Christian truth respecting Christ, and the oneness of his mediation, has been supplanted by the device of other mediators, and of another Christ,–Antichrist. Popery is the counterfeit of Christianity,–a most elaborate and skilfully contriven counterfeit,– a counterfeit in which the form is faithfully preserved, the spirit utterly extinguished, and the end completely inverted. This counterfeit Church has its high priest,–the Pope,–who blasphemes the royal priesthood of Christ, by assuming his office, when he pretends to be Lord of the conscience, Lord of the Church, and Lord of the world; and by assuming his names, when he calls himself “the Light of the World,” “the King of Glory,” “the Lion of the tribe of Judah,” Christ’s Vicar and God’s Vicegerent. This counterfeit Church has, too, its sacrifice,–the mass, which blasphemes the sacrifice of Christ, by virtually teaching its inefficiency, and needing to be repeated, as is done when Christ’s very body and blood are again offered in sacrifice by the hands of the priests of Rome, for the sins of the living and the dead. This Church has, moreover, its Bible, which is tradition, which blasphemes the Word of God, by virtually teaching its insufficiency. It has its mediators,–saints and angels, and especially the Virgin; and thus it blasphemes the one Mediator between God and man. In fine, it blasphemes the person and the office of the Spirit as the sanctifier, because it teaches that its sacraments can make holy; and it blasphemes God, by teaching that its priests can pardon sin, and can release from the obligations of divine law. Thus has Popery counterfeited, and, by counterfeiting, set aside, all that is vital and valuable in Christianity. It robs Christ of his kingly office, by exalting the Pope to his throne; it robs him of his priesthood in the sacrifice of the mass; it robs him of his power as Mediator, by substituting Mary; it robs him of his prophetical office, by substituting the teachings of an infallible Church; it robs God the Spirit of his peculiar work as the sanctifier, by attributing the power of conferring grace to its own ordinances; and it robs God the Father of his prerogatives, by assuming the power of justifying and pardoning men. In the second place, the pontiffs claimed to be the successors of the apostles. This was a more masterly stroke of policy still. To the temporal dominion of the Caesars they added the spiritual authority of the apostles. It is here that the great strength of the Papacy lies. As the successor of Peter, the Pope was greater than as the successor of Caesar. The one gave him earth, but the other gave him heaven. The one made him a king; the other made him a king of kings. The one gave him the power of the sword, the other invested him with the still more sacred authority of the keys. The one surrounded him with all the adjuncts of temporal sovereignty,–guards, ambassadors, and ministers of State,–and set him over fleets and armies, imposts and revenues; the other made him the master of inexhaustible spiritual treasures, and enabled him to support his power by the sanctions and terrors of the invisible world. While he has celestial dignities as well as temporal honours wherewith to enrich his friends, he can wield the spiritual thunder as well as the artillery of earth, in contending with and discomfiting his foes. Such are the twin sources of pontifical authority. The Papacy stands with one foot on earth and the other in heaven. It has compelled the Caesars to give it temporal power, and the apostles to yield it spiritual authority. It is the ghost of Peter, with the shadowy diadem of the old Caesars. We take first the doctrine of infallibility. Can anything be conceived more fitted to crush all intellectual vigour than such a doctrine? As an infallible Church, Rome presents her votaries with a system of dogmas, not a few of which are opposed to reason, and some of them even to the senses. These dogmas are not to be investigated; the person must not attempt to reconcile them to reason, or to the evidence of his senses; he must not attempt even to understand them; they are simply to be believed. If he demands grounds for this belief, he is told that he is committing mortal sin, and perilling his salvation. Here is all action of the mind interdicted, under the highest sanctions. The person is taught that he cannot commit a greater crime than to think; that he cannot more grievously offend against his Creator than by using the powers his Creator has endowed him with. Thus, while the first effect of Christianity is to quicken the intellect, the first effect of Romanism is to strike it with torpor. She inexorably demands of all her votaries that they denude themselves of their understandings and their senses, and prostrate them beneath the wheels of this Juggernaut of hers. While the Protestant is occupied in investigating the grounds of his creed, in tracing the relations of its various truths, and in following out their consequences, the mind of the Roman Catholic is all the while lying dormant. As the bandaged limb loses in time the power of motion, so faculties not used become at length incapable of use. A timid disposition, an inert habit, is produced, which is not confined to religion, but extends to every subject with which the person has to do. His reason is shut up in a cave, and infallibility rolls a great stone to the cave’s mouth. This entry was posted in Recommended Books, Roman Catholicism, Theology and tagged Church History. Bookmark the permalink. Thanks for sharing this Manfred. We are to call no man father, or teacher…or reverend either. For you see pastor worship is just as much alive in what calls itself protestant, yet seeks to return to Rome , as that which calls itself Catholic and yet worships it’s vicars also. Priestcraft is no different than what Diotrophese spun. One is the Great Harlot, and the Mother of all Harlots, and the rest are her daughters. Now there be one Ecclesia that the Gates of hell cannot prevail against, and she be the Ecclesia Victorious and Bride of Christ. Living Stones scattered and yet formed and fitted together by our Lord! Elect from the foundation of creation, yet as guilty as the lost, but for the Blood of the Lamb which covers our sins, being made alive by the Spirit. Be ever thankful for the fellowship of the saints, for the time is short and the remaining of this age dreadfully dark…But be always of good cheer for He has overcome and is worthy! Mickey – thanks for your comments and amen! As for my avatar, freely I have received and freely I give. Choose whatsoever avatar you wish, only choose carefully. I’ve considered choosing Manfred the Wonder Dawg. I prefer my current one I guess…It seems to mirror how my mind works!